So I got it into my head sometime during the middle of December that I wanted to do two things – a football wreath and a Super Bowl party. Now as the Super Bowl gets closer, I will talk more about my Super Bowl party, more specifically how to pull off a Super Bowl party on a budget. This post its all about that first statement you make for a Super Bowl Party. I’m talking about decorating your front door for the occasion with a football wreath. It seems silly, but to me when guests arrive, this starts the experience. So that’s where I’m starting. Now as I said, I was inspired back in December well before the teams had been filtered down to the two competitors for the Super Bowl. (For the record, it is officially the New England Patriots and the Seattle Seahawks this 2015.) At the time I decided to make a generic themed football wreath that was not team specific. That way if by some odd chance my home state Panthers or seaside southern neighbor Chargers or the northern 49ers or Texas city good-looking male reference mascot who shall not be named for fear of family disownment made it in to the Super Bowl, I wouldn’t have to redo my football wreath. I had this great idea for inspiration of doing simple green, white, silver, burlap and footballs. But I confess as I put my wreath together, it felt boring. So out of desperation I mean inspiration, since we had no official pro team we supported and well because Dollar Tree had these colors, I decide to make my football wreath with my college school colors. Still generic with no specific team referenced but I must admit I like the added color. I tried three new techniques for this football wreath. (I love making wreaths and you can find two on Wife, Mom, House…Oh My! One was an Easter Wreath and the other was a Christmas Wreath.) There were some lessons learned along the way of making my football wreath and some “I don’t think I’ll be doing that again” moves. And yes I will share all. But in the end, I love my football wreath and it was super inexpensive. Plus, I think a great entry statement for my upcoming Super Bowl Party. For my Easter Wreath, I experimented with a pool noodle. I loved the results. Not only was it cost effective but it looked pretty and was pretty easy to use. That said, by the time Easter came, the wreath had shifted from a circle to an egg. It worked seeing as it was an Easter wreath and I could sort of make that work for a football wreath but would rather not. Solution: This time I wanted something sturdier, so I opted for plumber’s pipe insulation tubing. Actually 2 and this was definitely uncharted territory for me and my wreaths. I choose the two smallest sizes and inserted the smaller into the larger of the two. I split the already pre-slit side of the larger and inserted the smaller. This did create a small gap but it would be covered with ribbon so that was okay. I next made my circle and, with some help, I secured the two ends together with electrical tape. When I got back from dinner and saw that I had an ever escaping snake in the form of plumber’s pipe insulation tubing and that my circle had come undone, I pulled out the duct tape. With some help, I again secured the two ends together to create the circle for my football wreath. When in doubt ALWAYS reach for the duct tape. Speaking of duct tape, I then wrapped the tubing with one of the mesh ribbon rolls securing the ends with duct tape and hot glue. This would be one of my new techniques. I have never hot glued anything to a wreath before. There was a learning curve. Mainly, I couldn’t just jump from one element to the next. I had to wait for them to dry before moving on to the next. I did the same thing for the green and orange ribbons. For the football thermos, I removed the strap, colored in the stitching with a silver Sharpie, razor blade removed the hooks for the strap and hot glued it to the wreath. After all, what’s a football wreath without a football majorly displayed. I did however need to cover the thermos top. Solution: Pompoms. Pompoms would fit on a football wreath. When I was a cheerleader, I learned to get your pompoms nice and fluffy, you rub the crap (technical term) out of the strands between your palms. This crinkles them so they are nice and fluffy. So I made my own mini pompoms by taking silver shred and rubbing the crap (again technical term) out of it between my palms, securing it in the middle with wire ribbon and then sticking them into the football wreath. Tip: trim your long shred strands once the pompoms are attached to the football wreath so they really do look like pompoms. Multicolor shred works too. Next, I added the remaining elements to my football wreath including the mini megaphones I grabbed for a $1 at the DollarTree, two mini bouncy rubber footballs found at Party City for 60 cents each, and because I thought they looked like the confetti burst shot at football game entrances and championship game endings, springs of berries in various shades of orange. I also added a bow. While essentially this is the same bow I have done for years where you layer three types of ribbon, working with the white mesh ribbon was a whole new experience. I learned that instead of simply wrapping and layering the three ribbons at one time, I had to do the mesh first or I ended up with mess, not mesh. To finish up my football wreath I added thin gauge wire to create a hook. To do so, I wrapped the two ends around the tubing, hidden behind the bow, and let the middle form the hook. All in all, it was a fun experience making my football wreath and I think it makes a nice statement piece for my entry. And well, I am one step closer to being ready for my Super Bowl Party. 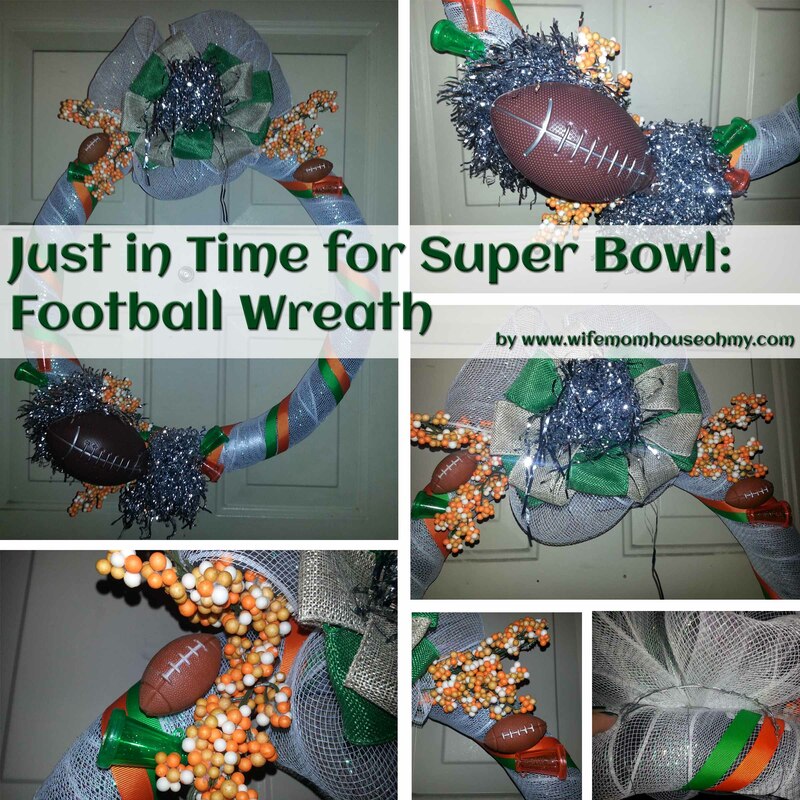 Bonus: I can now use my football wreath for any future football party – Super Bowl or not.